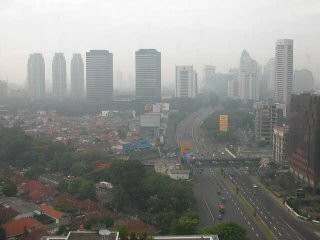 Our trip in Jakarta, Indonesia. It was quite a hectic business trip. We never have a chance to take a walk in Jakarta. We met and talked to a lot of people there, who come from different states and different corners of Indonesia. But lastly I came to realize that I've never walk out from the hotel entrance since I touched down from the airport until the last day in Jakarta when rushing back to the airport. Oh man! It was nearly a week. Hah, but I've no complaint and luckily I did buy some special souvenirs in the airport. Since I'm sleeping late tonight, let us think of the possibilities WHY they’re getting married so fast. Why I think they are getting married? He needs someone that can understand him? It's been a llooooooonnnnnggg time since I post. I'm actually feeling guilty of that. 1. Jo Han Mok is getting married in Singapore this year. 99% that Patric and I will be attending. It was surprising news since he's a person who doesn't look like a man who wants to settle down so fast. Hmmm... I guess, when the right person is in front of you, things change for better. :-) Also, I think he have lose weight and look better now. 2. Another friend of mine who Patric and I visited several times in Hong Kong last year is getting married too! When Kelvin Hui told us he's getting married, we were surprise as well. Of course we were happy for him because he looks very happy to have a wife. However, seeing Kelvin getting married is not as surprising as Jo Han because Kelvin's look more like a family man compared to Jo Han. :-) He also love cats so I don't know how he's going to take care so many of them when he has a baby. Hah, but I know he'll has his ways. 4. New site. I'm setting up a new salesletter page soon to make money online. But I'm very new to writing salesletter, doing email marketing, etc. I realized that the ultimate secret to be successful online is to have a mailing list. Making money from Adsense is good but I don't think it's 'secure' or 'stable' income. Good thing is, I take it as a fun thing to learn. Hehe... call me lucky. 5. Do you know that there is a quality score for Adsense as well, not just for Adwords? If your page has certain good qualities set by Google, it will display Adsense ads that will earn you more per click. I heard one of the main 'ingredients' to have high quality score is to add quality links to your pages. Quality pages can be defined as pages related to your niche or with high PR. I'm writing 5 updates at once hoping that it'll cover my guiltiness of not posting for so long. "Gong Xi Fa Cai" to you even if you're not a chinese! 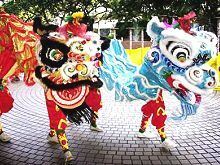 Today is the first day of the Chinese New year for all the chinese all around the world. Especially new year eve, a reunion dinner is a must, where members of the family, near and far, get together for celebration. The venue will usually be in the home of the most senior member of the family. Like Christmas, the Chinese New Year is the most important holiday in the year for the chinese and it's a good time for the family to get together as well. "Gong Xi Fa Cai", a greeting to every chinese during Chinese New Year; Lion dance to sweap away the bad energy; "Red packets", traditionally, red packets are passed out during the Chinese New Year's celebrations, from married couples or the elderly to unmarried juniors, it's common for adults to give red packets to children; Firecrackers come individually or strung on a long string. They are cased in red paper, as red is auspicious. The loud popping noise created by the explosion is thought to scare away evil spirits...Hahaha, chinese have lots of myth ;p .
The first step in doing business online, no matter is a Adsense / YPN publishing business, affiliate marketing and etc. is to choose your URL. The URL is the web address that someone types in when going to a website. The URL you use for your business is very important and must be chosen carefully. The URL you use must have your most important keywords in the URL whenever possible. If you are offering dog training, you should absolutely have the word "dog" and "training" in your URL. Unless your business is already established, you have the ultimate freedom in what your business will be called. Oppss, please do not compare this scenario with my www.emilykhoo.com, hahaha, because I'm doing this blog is just for fun. Don't you see that I did not optimize and monetize my blog at all? Okay, back to the point, if your online business already exists, you are more limited as to what URL you choose. 1. Is it easy for your customers to remember? 2. Are any of your keywords in it? 3. Does it properly reflect your business? Preferbly with your niche keyword in your URL, it's easier for the spiders to index your website in the search engines as well. No reciprocal links for your Adsense sites? Once a website has been removed, it will no longer show up in results on Google.com or on any of Google's partner sites. Google dislike we participate in link schemes designed to increase the website's ranking or PageRank. In particular, try to avoid link to spammy websites, as your own ranking may be affected adversely by those links. Actually, you still can have some inbounce and outbounce links from related websites, you'll still get the actual benefits and without getting any penalty. So, do not just joining the link farms to get lots of reciprocal links, it's affect your marketing too. Hey, busy guys and girls, just a short message to remind you that Valentine's Day is coming. Come on, be romantic! Just get some stuff for your love one, no matter what gender you are or how old are you, love is always in the air, feel it! You take the first move if he or she doesn't want to. Why not? If you've no idea with what to go to, hah, then go to this website, they've hundreds of good stuff for you to go to...I've purchased some stuff there, I've compared the price is cheaper than the usual price in the supermarkets. It took only 4 days to reach me without paying any shipping cost. Infect, it's free shipping all around the world. Cool, right? I even heard about this site from a stranger girl that I've met at Broad Beach, Gold Coast. She told me that she bought lots of cheap perfumes there and also, her husband used to surprise her with surprise gifts delivered to her when he is not around. Sweet! It’s been a llooooonnng time while since I’ve posted in the blog. So here I am again, to share with you what I’ve found to make money online through Google Adsense. And other things too, of course...hehehe. If you’re not familiar with video websites, two of the most famous ones are Youtube.com and Google Video. At the same time, a close friend of ours, Peter Drew have created a free service that can help you to make money from Adsense by sharing videos. I was with Peter at his basement office. Peter and family vacation in Penang, Malaysia. 1). Get as many video files as you can. 3). Share them with as many people as possible and get “paid”! Even though if you’re not using Peter’s free system (Why not? It’s free! ), you should consider using video as a way to make money or generate traffic. But with Peter’s system, you’ll have one of the most powerful features ­built-in referring incentive! You'll find it interesting!! Ok ok, I'll try to show you how the videos look like in the next few post :) . 1. Taking picture with Queen Elizerberth & the Royal family in Madam Tussauds. 3. Palace Birmingham is where the Queen stays during weekdays when She is in London. 4. Winsor Castle - Queen will be here on weekends. 6. This is one of the 7 wonders of the world - Stonehenge. 7. Like bathing in the Romans' Bath in BATH, a total different city from London. 8. We were stucked in the London Eye, a 135m high, the world's tallest observation wheel(scary thing!). 9. Having a great London theater - The Wicked. Amazing show. Let's say you spend all your time working on getting good rankings in Google, Yahoo and etc., getting backlinks, checking keyword density, building a good webpage, or even running your pay-per-click campaigns and other things to bring more traffic to your site. Those are all great ideas . . . but if you aren't trying to increase your conversion, you are just leaving something on the table. Increasing your conversion can be as simple as changing your headline, or trying a new image. An increase of a fraction of 1 percent, that may not seem like a lot but it can mean huge increases in profits. Just by testing, you've just doubled your income! What I should do in order to increase my conversion rate? It's free! It costs nothing. Constantly testing new things will help you to increase your conversion. Don't forget that WE, too, can help! The last two weeks have been very busy. I just saw a posted comment from "Conray of The Wedding Favor Place" – If you’re reading, thanks for your comment about our "wounded" ozone. We (which means you and me), no matter whether we are entrepreneurs or home-mums or just a consumer have responsibility for our Mother Earth. The thing is, sometimes we FORGOT our own responsibility to take care of Earth. You see, it’s weird that we think of SOMEONE, it could be our spouse, our family member, our neighbors next door or other regions, other states, other countries will take care of this better than we do. So, we can "escape" from taking the responsibility – the responsibility of taking care of what we have, which is Earth itself. The reason why we try to escape is probably the inconvenience that it caused. What I’m trying to stress is that... the more advance and modern we are now, the more self-fish and self centered we are. We are all more emphasized on our own benefits and convenience. I know it’s an ugly truth and you might not like what you read, but I just need to spill out the truth once in a while. Perhaps you've seen someone close to you, it could be our close family, close friends or neighbours are doing something that hurting our Earth. I’ve just finished watching "Desperate Housewife" Season II last night (I know I'm a bit late). Somehow, it’s no longer as funny as it used to be (coz I used to laughed a lot when watching it) but a reflection of reality in life. I think what’s the most interesting part is, people tend to forgot those who had helped them to be where they are today. Ouch, it’s hurt! I hate to be betrayed. Ohh, Emily, you've been silly... Who Love To???! If you watched Desperate Housewife, you’ll understand what I mean when Bree’s son, Andrew is not forgiving his mum or when the Chinese housemaid of Gabriel slept with her husband. Another one was Zach abandoning his father in jail when he needs him the most – after all of the hard work of raising him up. People are so desperate in winning something that they won’t get any reward in return but losing the precious things in life. The funniest part is they don’t even realize it. It’s a good show, worth for watching if you haven’t watched it. I’ve learned something there. I know it’s just a soap, so to speak. But many people are doing the same the things and to Mother Earth as well. “She” has given us the Sun, Water, Air, Trees, Earth and etc. What are we doing to reciprocal what She has done for us? Think about it and share in the Comment below if you want to. Friends told me, their adsense incomes decreased drastically. I personally think that links are another major tool for adsense success, but it can be used or misused. To get rank in Yahoo, I think quantity backlinks are important. The more they are, Yahoo will think that your site is important to the users. In contrast, for Google, quality are more important than the quantity. Google will consider where do your backlinks come from, whether is come from a link farm or a blacklisted site which is still begging to be penalized. Also, be remembered, the number of the links and where you link to other sites will also take into account :) . So, Yahoo? Google?? I'll say BOTH!! Haha! Actually it's depend on your personal preferences which search engines to focus to. So that, you won't put too much effort in creating useless links because this will not improve your ranking. I'm heading to Australia, see you guys there....tata! I came to know that our beloved MISTER Ozone, who used to protects us on Earth by blocking ultraviolet rays from the sun is wounded now. Our ozone hole is expanded to the size that bigger than North America at the Southern Hemisphere, entire Antarctic continent, surprise surprise, at the same time........I feel sad. Our ozone now is having a huge hole which about 10.6 million sq miles or 27.4 million sq km. See blue shadow in the picture above, no kidding, it's really bigger than North America! On top of that, what's more important, it's nearly all of the ozone in the layer between 8 and 13 miles above our Earth's surface had been destroyed. Sigh...I feel like suddenly a nuclear bomb going off in my head! 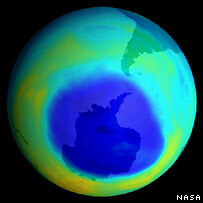 Ozone depletion caused mainly by human-produced compounds that release chlorine and bromine gases into the stratosphere. These high chlorine values covered the entire Antarctic region lately and this ozone depleting caused the Antarctic stratosphere weather is fluctuated. Experts' prediction, during the next 10-15 years, despite measures already taken, the ozone layer will be critically thinned. It is only after this crisis that we can envision its gradual restoration, which will probably last until the middle of the 21st century. However, we still can help to slow down the ozone depletion by our behaviour as a consumer. I think this is extremely important. "Get Emily's Latest Blog Update Notification!"